After you play an action, deal 2 damage to your opponent. Lillandril Hexmage is a common Intelligence creature card. It is part of the Core Set. In addition to the card's availability in the Core Set, three copies are included in the Brynjolf's Heist theme deck. "I have just the thing for them." "I'm a step ahead of you!" 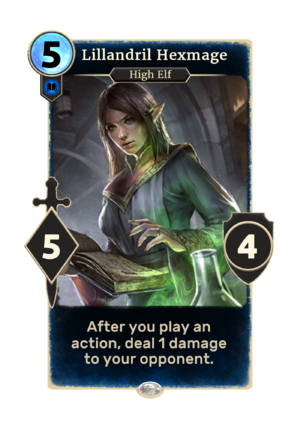 The card is named for the Summerset city of Lillandril. This page was last modified on 15 February 2019, at 00:02.